The Alan King-trained Sceau Royal made a classy return to action with a smooth success over two miles. A "tiny tweak on a suspensory" curtailed Sceau Royal's season in January last term, forcing him to miss all of the major spring festivals. However, King's charge showed no ill-effects from that setback in shrugging off a ten-month absence in the G2 event this afternoon. Barbury Castle handler King is now targeting the Tingle Creek Chase at Sandown Park on December 8, where he is set to take on the mighty Altior. King said: "Sceau Royal did it very nicely today and we're pleased with the performance. "He had a very slight tweak to a suspensory, it was not the end of the world and he came through it fine. "He hasn't missed a day's work since he came back into work this autumn. This race was always the plan and he came through it well. "Sceau Royal's big forte is that he is a very good jumper and very quick over his fences which always helps in races like this. 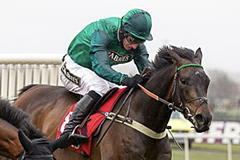 "I would like to think in the long-term that the Champion Chase is something we would think about. "In the short-term, I think the Tingle Creek is the plan. We would have to take on Altior who scares the life out of me, but someone has to run against them. "He is a very slow horse at home and I have to be careful who I run him with at home, but it's about what they do on the track which is more important." Simply Ned ran another very good race in defeat when finishing second in the G2 Shloer Chase for the third time, having also done so in 2014 and 2016. The 11-year-old, ridden by Brian Hughes and owned by David and Nicky Robinson, was sent off at odds of 28/1 but only went down by two and a quarter lengths to winning 5/4 favourite Sceau Royal. Simply Ned's trainer Nicky Richards said: "I'd say that's probably booked his ticket back to Ireland at Christmas [he won a G1 at Leopardstown on December 27 last year] and he won't look out of place, for sure. He's an owner's delight. We didn't give a lot of money for him the day we bought him and he's taken us to every party going. He's been absolutely brilliant. "He'll go on any ground but I wouldn't think about running him on firm." Third was Forest Bihan, trained by Brian Ellison and ridden by Danny Cook. The seven-year-old finished 12 lengths behind Simply Ned. Ellison said: "I'm over the moon. He just needed the run, that's all, and was cantering coming down the hill. The trouble with these horses is finding races for them. He's grown up a lot - he used to be too keen. He travelled and jumped out of this world and I think there's a big race in him this year."